Well, this happening much sooner than expected. It was only last week at the Detroit Auto Show when . However, it was only that, an announcement. Nothing debuted. Only a teaser. But thanks to the guys at the Mustang6G forum, we can now confirm that’s about to change. Next month, in fact. Mustang6G happened to be checking out the Chicago Auto Show’s website and noticed something. In the list of “Debut Vehicles” both the Bullitt Mustang and 2019 Shelby GT500 were there. While there’s no image (yet) for the latter, there is a placeholder instead. The Chicago show gets underway for the media on February 8, so if this reveal is indeed happening, then, well, do the calendar math. We’ve reached out to Ford to try and confirm the news, but we probably won’t hear back for a day or so. We’ll be sure to update you then. What we do know about the Shelby GT500, based on Ford’s Detroit teaser, is that it’ll be the most powerful street-legal Mustang ever built by the automaker. It’ll pack a supercharged 5.2-liter V8 with more than 700 hp. Your response, Dodge Challenger Hellcat? “This new Mustang is engineered to stand apart on roadways and race tracks, thanks to its new innovative track technologies, performance hardware, aggressive and functional track-tuned styling,” Ford said in a previous press release. 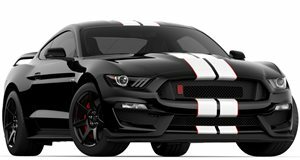 Its overall exterior styling will be more aggressive than the GT350’s, thanks to a new front fascia, vented hood, front “fangs,” and tons of Cobra emblems. We can hardly wait.